At the end of a day of trekking you really appreciate what your feet have been through, so it's good that the Mens Trekking Merino Classic Cut Sock cushions and supports your foot in crucial areas. Jack Wolfskin have used soft merino wool for comfort, and they still feel comfortable after a long day. The sock supports the ankle joint and cushions the Achilles Tendon, ankle, instep, toes and high stress areas on the sole of the foot. The robust, breathable fabric also keeps your feet dry, which is always the best strategy against blisters. 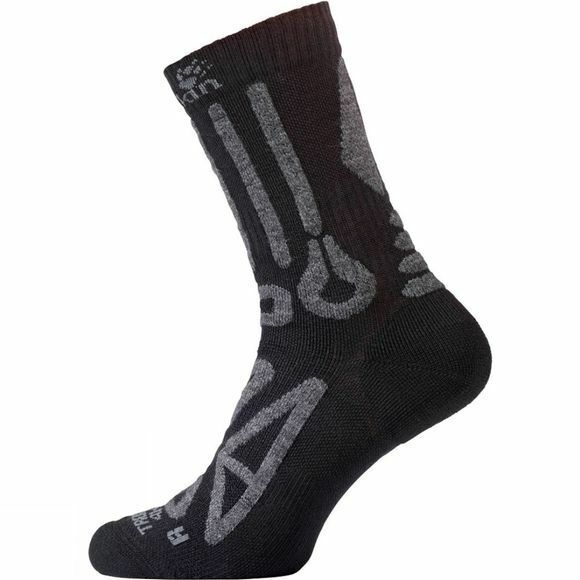 This sock was developed in collaboration with The Swiss sock specialists, X–Technology.